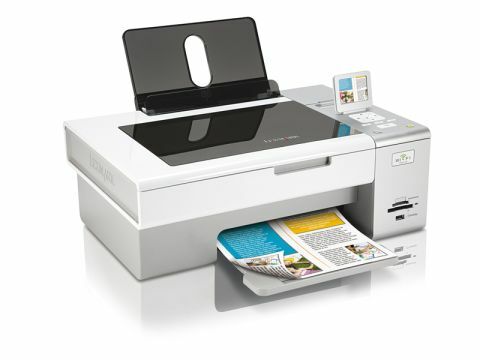 Lexmark includes the X4875 in its Professional range of All-In-One Inkjets and uses Lexmark's regular pair of inkjet cartridges - one for black, one for the three colours - and sports a list of features that don't seem especially professional. There's duplex support and 802.11g wireless (but no fax or wired Ethernet connection) and the card reader slots and PictBridge port would seem to be aimed at the home user. Installing the X4875 on our Vista test machine was something of a trial. The three CDs of software install Lexmark Productivity Suite, OCR and Fax software, but there is no separate driver. Once the software was installed the printer spat out a test sheet and then refused to communicate with the laptop. We could print pictures and text documents directly from a USB key, but printing from the machine simply didn't work and it didn't help to download the latest software from Lexmark's website. Copy speeds for both mono and colour pages were slow. Thankfully we had a second option, as we were able to use the 802.11g wireless print function. We configured the connection software for wireless rather than USB, expecting to connect our Lenovo ThinkPad X300 directly to the Lexmark, but instead had to plug in the USB cable to tell the printer to connect to our wireless router. Once that was done we could remove the cable and print wirelessly and found that print speeds were acceptable. This is also the best way to describe print quality, as text lacked sharpness and colours lacked impact. As a final step we disabled the wireless on the X300 and plugged in a USB cable to try and print more documents. With the cable connected we were informed there was a 'problem communicating with the printer' and refused to print. There are some neat options in this model, but the drivers simply fail to work.